So, you got that new project you’ve been putting off for the past several months, and you finally have the time to work on it. Except there’s something of a snag on those plans: the time you have is in the dead of winter. Assuming you live somewhere away from the south, where winter actually means something, this can be a huge problem for you. Mostly because construction companies have a nasty recurring habit of not insulating garages like they do the rest of the building. Well, if you can’t get something done right, do it yourself. 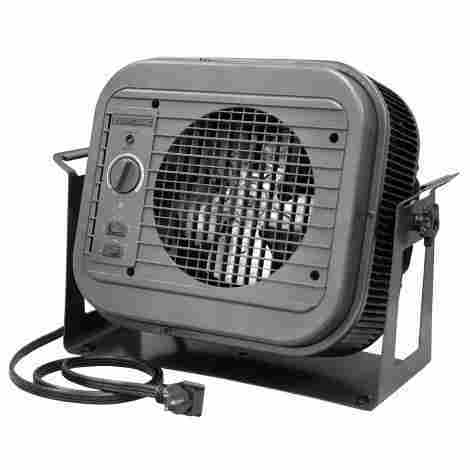 Starting off our list with #1, we have the Mr. Heater MH9BX Buddy Garage Heater. 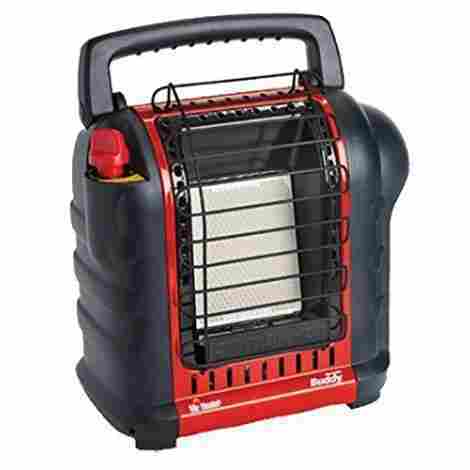 When it comes to generators and portable heaters, few people do it quite like Mr. Heater. And for a good reason, as they are considered one of the leading manufacturers of heaters in the country. So, what got them to the top of the food chain? Let’s find out. 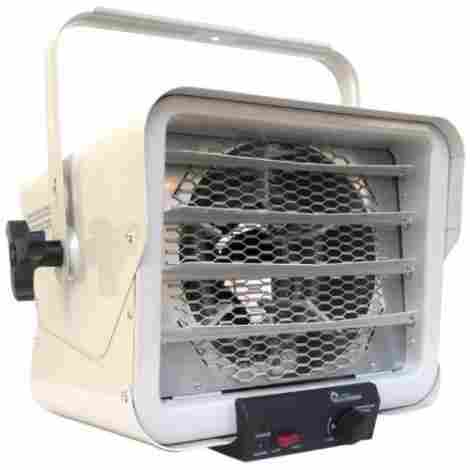 Portable heaters like this are typically powered by being attached to a propane tank, with the fire coming from a small but potent pilot light. As you can tell, this is not something you would want tipping over, even in a clean stone floored garage. So, to keep any potential fires from breaking out because of simple carelessness, this heater is designed to shut off automatically if tipped over, if it detects low amounts of oxygen, or if brought to altitudes 7,000 ft above sea level. But what good is a heater if it can’t actually heat anything up? That’s why this heater can provide and circulate heat to enclosed spaces up to 225 sq ft wide. So, no matter how big your garage might be on the inside, this heater will make sure it’s nice and toasty within minutes. It stands to reason that these things would not be cheap, but with that being said, the price of this heater is shockingly fair and lenient. Coming in second place, we have the Fahrenheat 240-Volt Garage Heater. This heater is a bit of a different beat than the previous entry, more resembling an air conditioning unit you mount in the windowsill. So, what does this heater actually have to offer you that the previous entry doesn’t? Well for starters. Louvers are those flaps you often see on the vents of air conditioners and heaters. They help guide the air that comes out of them in specific angles to get to certain parts of the room. So, if the room isn’t heating up in your area as fast as you need it to, you can just alter the louvers and enjoy some nice warm air. Some people are skeptical of portable heaters, due to the fact that most of them are just supposed to be left on the ground, where they could tip over and set something on fire. 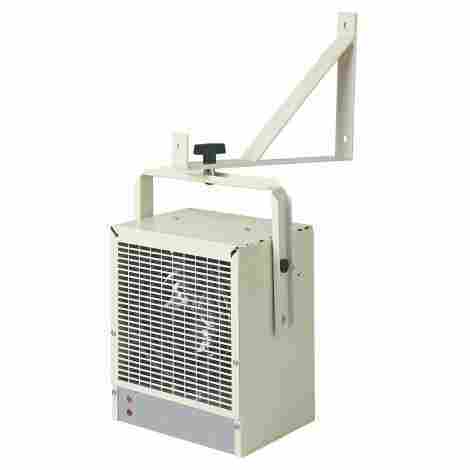 However, this heater comes with a handle that is itself outfitted with ceiling mount brackets. So, if you want your heater safely kept away from anywhere it could start a fire, just mount it to the ceiling. As we said, cases like the first entry, where the price is actually nothing too unreasonable given the abilities of the heater, are very rare. As shown here, as this heater is incredibly expensive, as is customary for heaters such as these. 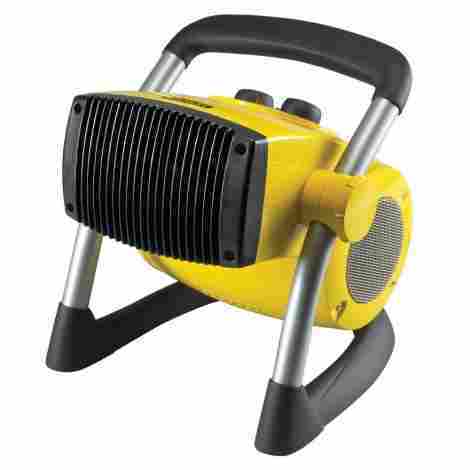 Finishing up our top three segment, we have the Lasko Stanley Pro-Ceramic Utility Heater. Lasko has always been known for innovative design choices within industries that many believe to be impossible to innovate within. And all for a decent price to boot. So, what does this one bring to the table? Let’s find out. Yes, this is a heater, so naturally, you want to keep things toasty when you’re using it. However, the difference here is that you may not want it to be too toasty, or maybe bring the temperature down a bit once you’ve sufficient;y warmed up the room. THis is why this heater comes with adjustable thermostat control that you can use to control the temperature of the air your heater is putting out in real time. Louvers are great, but they often aren’t as effective as you may prefer them to be. And if one of those flaps falls off, the whole thing may as well have been broken. Which is why this heater comes equipped with a pivoting feature, which you can use to just move the entire heater to a different angle at will. After all, why alter the air flow, when you can just alter the whole dang heater? From one of the priciest options on this list, to easily the cheapest yet, this heater has one of the best prices on the entire list, mostly being attributed to its small size. Coming in at #4, we have Cadet’s “The Hot One” Space Heater. 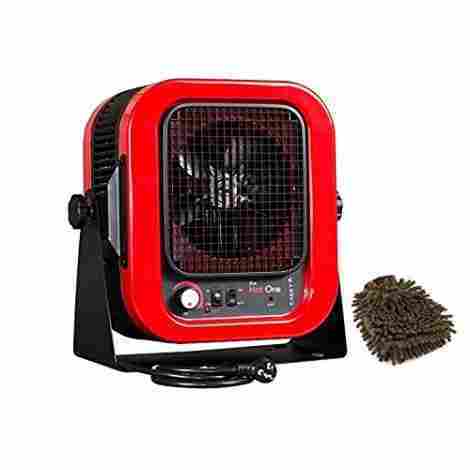 This space heater, armed with a powerful aluminum heating element and a 4000-watt capacity fan, is one of the best heaters around for heating up a small garage or workshop. What makes it such? Let’s find out. One of the many drawbacks with conventional heaters, and definitely a few heaters on this list, is the fact that they tend to make a bunch of noise. Even the quieter ones on this list tend to have a low hum about them that’s just noticeable enough to be annoying. However, this heater is incredibly quiet, making basically no sound, even when running full blast. Just like how you’d rather not be sitting there in a super cold car, waiting for the heat to circulate, you’d also, we imagine, rather not have a heater that took its sweet time heating up your garage or workshop. But within 5 minutes, heat will be blowing out of this heater full steam. Making sure that you can get to work warmer as well as faster. And just like that, we’re back to incredibly expensive price tags for our heaters, as this one is almost as expensive as the 2nd place entry, in fact depending on the buyer, it’s often even more expensive. For the #5 spot, we chose the Dyna-Glo Liquid Propane Forced Air Heater. Dyna-Glo has almost always put out consistently excellent products, and in our opinion, this one is no exception. 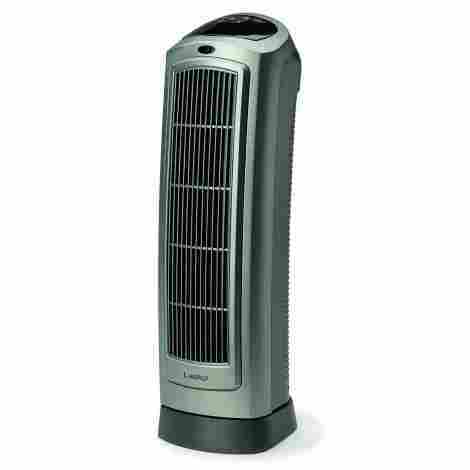 In fact, many out there, ourselves included, consider it to be one of the best heaters available on the market right now. A heater is only as good as the amount of space its heat can actually cover. Fortunately, this is something that this heater has down pat. In fact, the area of effect it has is easily one of the largest on the entire list, at a whopping 1,350 sq. ft. So, you never have to worry about cold spots in your garage. Being a heater that you have to leave on the floor, this heater shares the first entry’s specialty of having an internal computer that’s just smart enough to know when to turn itself off. While it doesn’t have quite as many scenarios in which to turn off as the first entry, it knows enough that it should probably turn off automatically if pushed over. While still rather pricey, and definitely more expensive than the previous entry, this heater is nowhere near the astronomical prices of the pricier entries on this list so far. 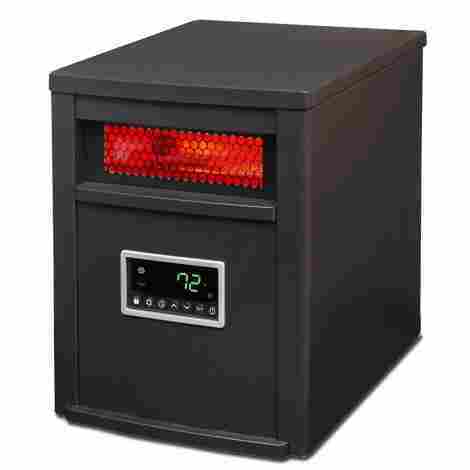 Coming in at #6 is the LifeSmart 6 Element Infrared Heater. Infrared heaters are an interesting specimen when compared to the heater’s we’ve discussed so far. Rather than blowing out hot air and circulating it around the room, this heater sends out heat waves to heat up various objects and furniture. The objects then project the heat out, and that does the circulating for it. Fascinating, some might say, but what are the benefits? Well, let’s see. We should probably start off with the biggest benefit that an infrared heater brings to the table that the others don’t: basically, no risk of fire. Oh sure, back in the day, there was a risk of overheating, but automatic shutoff switches internally placed into the machines basically make that a non issue. And since it doesn’t use hot air or a pilot light of any kind, you’re in no real danger when you use this heater. This heater is completely adjustable in its settings via a remote control that’s included with the heater. Now you can adjust your heater’s temperature, intensity, and a load of other settings, even from all the way across the room. We continue the trend of constantly flip flopping between expensive and affordable with this entry, which, while not cheap by any means, is still pretty affordable when compared to the previous entry. It would seem Mr. Heater finally got that promotion, as we have our #7 spot, the Dr. Heater Hardwired Shop Garage Commercial Heater. Dr. Heater, despite sharing half a name with the brand that topped our list back at #1, is actually a completely different company altogether. And as you can see, they too make some very fine garage heaters. It doesn’t matter how much heat is being generated by the heater if there’s no way to actually get that heat out into the room. Otherwise, it just hangs where it’s generated, eventually spreading out to the rest of the room. But this heater’s dynamically 8 inch fan provides maximum air flow to whatever room you’re in and circulates the heat around the room within mere minutes. While a simply dial placed beneath the fan, this heater still has a very nice thermostat setting to help you control the amount of heat you’re sending out into the room. So, if you need just a little heat but not too much, just turn the dial to the appropriate setting and let the heater go to work. Once again, we go from affordable to expensive, as this one is much closer to the pricier entries we’ve shown at, the earlier parts of this list. While not quite as expensive as they are, it’s still pretty pricey. Kicking off our final three entries, we have the Lasko Ceramic Tower Heater. As the name implies, this here is a big tower heater that you normally find indoors and blowing normal air instead of just heat. But don’t be fooled, as this heater is one of the best, most efficient heaters for your garage out there. Allow us to explain further. The main thing all heaters face is overheating. When you’re dealing with anything electronic that puts out high amounts of heat, you should always make sure that said machine has the ability to handle the very heat it generates, because otherwise, what’s even the point? Which is why this heater comes with automatic overheating protection. Regulating the temperature of a heater can be tricky. At worst, you have to constantly hover near your heater, keeping constant watch over it for when things finally get too hot, and you have to program in for the heater to bring things back down to a more manageable temperature. However, with this heater, the ceramic element included in the heater’s build helps the heater to regulate itself and automatically adjust to a more manageable temperature. This is probably the cheapest entry on the list so far, standing at a very reasonable price, especially considering everything it actually offers you. 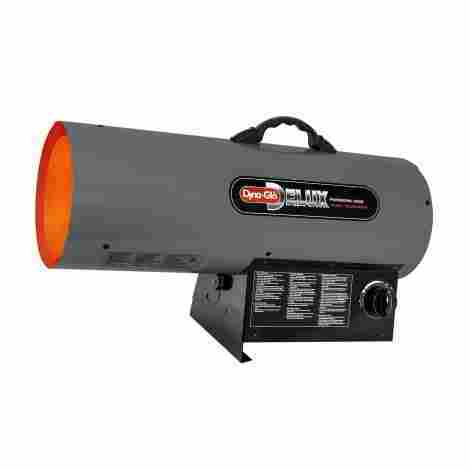 For our second to final entry, we have the Dr. Infrared Heater DR-988 Garage Shop Heater. Once again, we have another of the always fascinating infrared heaters, which put out intense heat waves that warm up the room by warming up the furniture around the room. So, what does this one does that the other didn’t? Let’s find out. Lots of heaters with built in thermostats have the same temperature potential as your normal thermostat. But with that said, much like your normal thermostat in your home, how likely are you to actually use those higher settings? This is why this infrared heater has a much more restrained temperature range of about 45-95 degrees Fahrenheit. Got a personal workshop out behind the house? Got a personal project in that workshop that you want to do, but can’t during the winter? Well now you can, as this heater is great for smaller, personal spaces. And while you won’t get very far with this when trying to heat up a giant garage, for smaller areas, it works like a dream. Of course, continuing our trend, this price tag goes straight into the triple digit price range. But at least the price it gives isn’t anything too bad, and like all the ones before, you’re definitely getting what you pay for, so it all evens out. 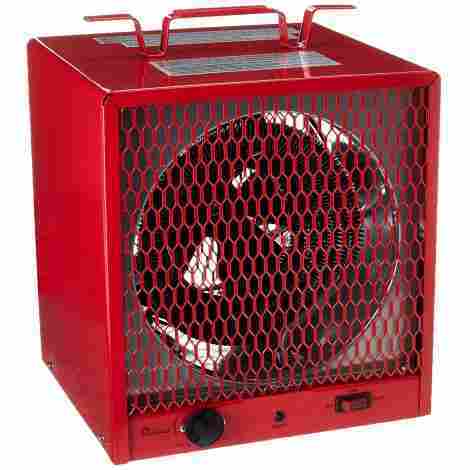 For the final entry on this list, we have the Dimplex 4000-Watt Garage/Workshop Heater. Unlike the other entries on this list, this one is solely meant to be mounted to the wall, hanging from a dedicated wall mount. What advantages does this bring with it? Let’s find out. The main advantage of being mounted the way it is is that since it isn’t fastened down in any one direction, instead of hanging off of the bracket by the handle, it can be adjusted to any direction you need. Just give it a little tap and swivel the heater to point in the direction you need it to be. So, if you notice a cold spot in the corner behind it, no worries. Just point it backward and wait a minute or two, and the whole room will be circulated heat. This heater is the biggest name in economical performance, utilizing a fan delay in order to use the residual heat from its stainless-steel heating element to get some extra heat into the room. Meaning that this fan gets out more heat at a faster rate than almost any other fan on the market right now. What better way to end our list than by finally breaking the pattern of the cheap product followed by expensive and so on so forth. However, that means that the biggest problem with this entry is that the price is a good bit higher than most would be willing to pay for a heater like this. Working in a garage can be one of the most convenient things associated with your hobby. Everything you need is gathered and carefully organized the way you want it, and everything is available at your fingertips as a result. However, it can also be one of the biggest obstacles in your way. Almost no garages out there have insulation like the houses they’re attached to, as well as zero heating or air conditioning built in. So, during the summer you’re stuck in this hot box with only one direction in which to get anything resembling a breeze, and in the winter, you’re basically trapped in a freezer that circulates cold air from outside, causing you to slowly turn into a popsicle. This is where garage heaters come into play. They’re a bit too crazy in terms of output to be put indoors, but they make perfect heating systems for your insulation void garage. And if that’s what you’re looking for, then you’ve come to the right list, as every single one of the entries on this list will give you exactly what you need from a garage heater. So, if what you need from a garage heater is efficiency and craft like no other, look no further. Pick an entry from the list and give it a try. Coming up with a list of criteria for this list was actually rather simple. It was just a matter of asking what we wanted our garage heaters to do for us if we owned one, applying that to the list, then going into specifics to figure out more about them. So, with that said, here are the most vital criteria we used to evaluate which entries got onto the final list, and how far up the list they got once there. This was obvious, to begin with. Power in this case, of course, means heat, and this criterion addresses how much heat the heater in question puts out at one time. And this differs wildly based on the kind of heater you’re talking about. A smaller heater typically can put out about 4-9,000 BTU, for example. Meanwhile, a larger heater meant for a big garage or workshop can put out as much as 30-60,000 BTU. We tried to make sure a little bit of every side of the spectrum got onto this list in one form or another, because a lot of garages are different, and thus you need to know where you can get a heater that can work with your garage’s size. However, where there’s power output, there needs to be a certain countermeasure in place. Heaters, as you can no doubt deduce for yourself, put out a lot of heat, usually for a decently long time per usage. As such, these being electronic devices in nature that usually plug into electrical outlets in the walls, the threat of overheating is somewhat high. When these types of heaters were first being introduced into the mainstream market, they overheated like it was going out of style. Because there were very little countermeasures installed in order to handle them when they did. Fortunately, this is no longer a problem. The main means by which a heater will protect itself from overheating is by, put simply, shutting itself off. This is also why you’ll see the term “ceramic” tossed around a lot more than you might expect with these heaters. Ceramic conducts heat better than any other commercially available stone on the market, so it’s a great conduit by which an internal mechanism can use to decide when the outside has gotten too hot, and the inside isn’t too far behind. Whereupon it will just turn itself off. And for good measure, especially if the heater in question is powered by a pilot light, it will also turn itself off if tipped over on its side or back. A lamp tipping over caused the great Chicago fire, after all. Even when the heat is going full blast, you may not be satisfied with the amount of heat being put out, how hot it is, or the direction in which it’s going. So, we made the amount you could adjust your heater a big criterion for this list. This is why heaters have onboard thermostats attached to the top of the device. Because you may think the heat being put out isn’t hot enough or is even too hot for you. So, it helps to have a means by which to lower or raise the heat. And then there’s air trajectory. Now, heated air is still air, and you can’t outright tell air where to go, especially when it’s on the move. You can, however, give it directions. So, garage heaters will swivel, they’ll turn, they’ll have built-in louvers that will guide the heat at certain angles. And a whole bunch of other methods we’re probably forgetting. The point is that there are a million different ways in which a heater can make using it easier on the user. And the implementation of at least one or two of these played a big part in getting on the list. This isn’t quite as required as the others in this segment, but we still considered it important to use as criteria. The thing to remember about garages is that, if you’re doing anything other than parking your car inside it and going inside, you’re probably going to be scurrying around the place, looking for tools and working on various things. So, one thing you definitely don’t need to worry about is tripping over your heater and potentially breaking it. Not to mention the potential of tripping over it and planting face first into the unforgiving concrete floor. So, we considered it rather important to make sure as many entries on this list as possible had some means of mounting themselves to either the ceiling or walls. This way they can get better coverage of the room overall, and also keep out of your way while you’re trying to work. For the final criteria for this list, we looked at the price of each entry. It was almost humorous the way the bones fell for this list, as we legitimately did not intend for every entry except for the final one to be a constant back and forth of expensive and affordable prices. That’s just kind of how things worked out, which we certainly found to be humorous. But in any case, indeed, the price of a garage heater tends to depend on a few different things. Usually, it’s the size, the number of features it sported, how much heat it could put out at once, and lots of other things that all added up to create the price of each entry. However, as you can tell from the list, all of those features do not instantly make a successful product. So, we made sure to Look at how well each entry justified its asking price too. For the final segment of this article, we’re going to look at some of the most frequently asked questions surrounding garage heaters. Heaters can leave a lot of people worried, because of the risk of overheating, and with it, the risk of bursting into flame and burning your house down. So, people generally want to make sure that they have all of their bases covered beforehand. As such, here are the most frequently asked questions about garage heaters, and the answers thereof. Q: What size garage heater to I need? A: This all depends entirely on the size of the garage itself. Some garage heaters are great for smaller garages, for example, but just can’t generate the needed heat to properly heat up a larger garage and then keep it at that temperature. And then, of course, there’s the operating cost of keeping a heater running for longer periods of time in order to heat up a garage that is way too big for it. And on the other hand, if the warmer is too big, you’re paying too much for a heater that puts out too much and wasting so much energy. To figure this out, you need to break out the measuring tape. A good formula to follow for this is to multiply the length of the interior by the width. Heaters, and the areas they cover are measured in square feet, so this is a great way to figure out how much area your garage has compared to how much the heater can actually handle. Q: Which is better, a portable or mounted heater? A: This is a tricky one, and a lot of it is steeped in personal preference. Both sides have their specific pros and cons. On the one hand, you have portable heaters, which you can take anywhere in the garage you need, usually have plenty of slack from their power cord, and usually, come with a handle which you can use to carry it. The drawback here is that you can’t mount it anywhere, so you need to always leave it somewhere it won’t get in the way or risk you tripping over it. And with all of that power cord it has, that’s a lot harder than it seems. On the other hand, you have mounted heaters. A mounted heater’s main benefit is that you won’t ever lose track of it, it has a way better vantage point and thus more area coverage and is nice and safely out of your way, so you don’t have to worry about it. The drawback here is that you can’t take it anywhere if you need it. So, unless you bought one that swivels and points in different directions, you’re just going to have to deal with the cold spots. They also cost a lot more and are usually smaller than their portable cousins because they need to be in order to safely mount onto the wall or ceiling without risk of falling off. So, if you have a larger garage, your best bet is getting a larger heater that you can at least transport wherever it’s needed.